The ban on fox hunting with dogs in 2005 left many people pondering the alternatives to fox hunting. There weren't many but drag hunting was put forward as the main alternative. Drag hunting differs from fox hunting in that no actual fox is involved. Instead, an artificial scent is put down around twenty minutes before the hunt starts, and this is used to start things off. The hounds will follow this scent. 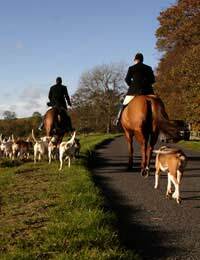 If they accidentally pick up on the scent of a live animal (for example, a fox), they must be stopped from giving chase (mostly because this is classed as fox hunting, which it is now illegal to use dogs for). There is a lot more jumping involved in drag hunting (than fox hunting), which makes it unsuitable for anyone who can't handle cross-country jumping. You also need to be able to maintain a gallop throughout, which often makes it unsuitable for youngsters who haven't learnt how to control their riding yet. The horses must be able to jump fences that are over 4 feet. The hunt is divided into three or four 'lines'. At the start of the hunt, everyone hacks to the start of the opening 'line'. Once the signal has been given to proceed, the hunt must follow a course (that has been mapped out in advance) for anything up to two miles. There will be various fences that need to be tackled along the way, although there is the option to sit out a particular 'line' if your skills aren't up to scratch. The hunt secretary will be able to tell you what is required for each 'line' before the hunt begins. Once a 'line' has been completed, there is a short break before the next one begins. All members of the hunt must stick behind the field master at all times. It is considered a breach of drag hunting etiquette to pass him. It's important to give your fellow hunt members plenty of space. Sometimes, a horse will refuse to take a jump. If this happens to you, move out of the way so as not to prevent others from taking the jump. You need to put a red ribbon on your horse to warn others if it is liable to kick out. A green ribbon is required if your house is new to the hunt. For the most part, drag hunters own their own horses, and use these. If you don't own your own horse, you can contact a local hunt. They can refer you to a local riding school, who may be able to offer a mount. The cost of getting involved in a hunt varies, but a single day entry usually costs around £40. A one-year subscription (which gives you the opportunity to drag hunt every weekend, as well as midweek drag hunts from time to time) costs around £360. This might sound expensive, but it's not nearly as expensive as fox hunting. Fox hunting meets can cost up to £1000 for a one-year subscription.